Pendulum Effect: You can target 1 other Spell/Trap Card on the field; destroy both it and this card. You can only use this effect of "Archfiend Eccentrick" once per turn. Monster Effect: You can Tribute this card, then target 1 monster on the field; destroy it. 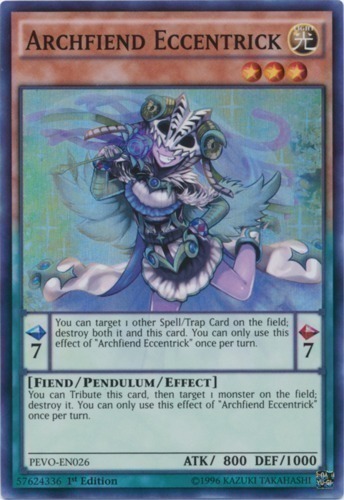 You can only use this effect of "Archfiend Eccentrick" once per turn.